"Seabiscuit" is the best big-story, big-heart movie of the summer. You know the type: it has underdogs, or rather an underhorse, and three men drawn to him by a common dream. Strings and cymbals crowd the soundtrack to the point of bumping elbows, and the action goes to slo-mo, then to black-and-white. An unseen narrator solemnly drops stones into the pond: "It was the beginning and the end of imagination at the same time," and the middle too, I’ll bet. Later, the Works Project Administration is described as "showing somebody really cared," which must be how it won the Strawberry Shortcake award. This heartwarming "true story" has an ambivalent relationship with reality, though. The film is based on Laura Hillenbrand’s 2001 bestseller of the same title, and those who have read the book must expect to make allowances for film’s need to compress and streamline. What’s puzzling is that the film also inflates and invents, and forsakes good, meaty truth for easily-recognizable cutouts. Jockey Red Pollard (Tobey Maguire), for example, has been given a ferocious temper, replacing the thoughtful, disciplined young man who carried a rosary and pocket Shakespeare. Pollard’s invented anger is given an invented cause: his impoverished parents are shown leaving the teen at a racetrack with the hollow promise that they’ll phone. In reality, Pollard’s parents were deceived by a family friend, who promised to care for the boy but abandoned him. Only once was Pollard’s dad able to save enough to travel to a race, but due to track rules, Pollard was not permitted to turn his head to look at his father in the stands. They never met again. That’s the kind of material real life can provide, but it’s too delicate for a towering-strings movie. Instead we see trainer Tom Smith (Chris Cooper) evaluating his wildly bucking new horse, Seabiscuit—then, hearing a fight, turning to see Pollard taking on four stablehands at once. He looks back at the rearing horse; then again at flailing Pollard; then back at the horse; then back at Pollard; then back at the horse?well, maybe not that many times, but it sure seemed like it. Director Gary Ross wants to make sure you get it, and on the DVD there will be an option to put this on endless loop. It seems ungrateful to say that this film could have been more, when it offers so much. The autumnal landscapes are breathtaking and the races are thrilling. Chris Cooper is compelling as the understated Smith, and William H. Macy is delectable as the overstated "Tick Tock" MacGlaughlin, a radio announcer with every accessory but a spinning bowtie. David McCullough provides the narration, but his dry voice is so unmistakably that of Ken Burns’ PBS documentaries that it meshes badly with Hollywood storytelling. Segments featuring his trademark tones and black-and-white stills repeatedly interrupt the action, as if someone put a movie and a documentary in a blender and lightly pressed "frappe." 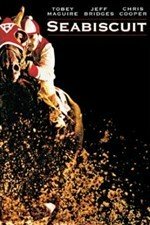 I particularly enjoyed a scene where owner Charles Howard (Jeff Bridges) hands out Seabiscuit’s old horseshoes to fans. Howard liked to do this in real life, and one recipient passed on a shoe to his friend’s little girl. My mother still has it. The moral of "Seabiscuit" is that damaged people, damaged horses, can overcome limitations through determination and hard work. No one, not even the horse himself, embodies this as well as the book’s author, Laura Hillenbrand. Over a decade ago she was suddenly stricken with a debilitating illness that leaves her at times unable to walk to the mailbox or even sit up. She expended her scant strength on the book, sometimes writing in longhand, lying down with her eyes closed. No wonder this story of stalwart overcomers inspired her; hers would have inspired them as well.